We perform a scenario analysis of three strategies for long-term energy savings and carbon dioxide (CO2) emission reductions in iron and steel production in China, using a linear optimization modeling framework industry sector energy efficiency modeling (ISEEM). The modeling includes annual projections for one base scenario representing business-as-usual (BAU) and three additional scenarios representing different strategies to reduce annual energy use and CO2 emissions from 2010 to 2050. Specifically, the three scenarios for cost-optimization modeling include changing the production share (PS), predefining emission reduction (ER) target, and stipulating carbon emission pricing (CP), respectively. While the three strategies are projected to result in similar annual energy savings by approximately 15 % compared to that of the BAU scenario in year 2050, the carbon emission pricing strategy brings about the highest annual energy savings in the medium term (e.g., 2025). In addition, adopting carbon emission pricing strategy will result in the highest emission reduction from BAU with much higher costs, i.e., by 20 % in 2025 and 41 % in 2050, while adopting either PS or ER strategies will result in a moderate level of emission reduction from BAU, i.e., by approximately 4 % in 2025 and 14 % in 2050. 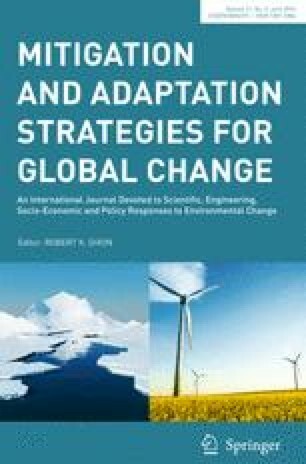 The analysis of China’s national strategies to reduce energy use and emissions provides important implications for global mitigation strategies. The research was funded by the US Environmental Protection Agency (EPA) through the US Department of Energy under Contract No. DE-AC02-05CH11231. We appreciate the EPA Project Officer Eric Smith for his support.